Great summary. Might I add that the best way to get good at grading is to become an EFL examiner at the first chance you get, e.g. to volunteer to be an IELTS, BULATS or FCE examiner. This isn't much good for beginning teachers as they won't accept you until you have at least 3 years' experience, but I learnt a lot when I became a BULATS examiner that has been useful in all kinds of other marking situations. The closest equivalent you can do if that isn't possible is to teach classes preparing for similar exams and use what ever you can find out from teacher's books etc to help you with marking fairly. In the good ole days Cambridge ESOL also used to give out the marking rubrics in the Handbooks, so if you can find an old copy you will be able to mark almost like a real examiner. These old Handbooks (and some exam textbooks) have model answers that can also help a lot. This all makes sense from the point of view of individual development, if that were the only reason for school to exist, but many EFL programs in Asia and elsewhere operate with the assumption that the program is serving the needs of other institutions that will employ graduates or accept them as graduate students, so teachers may reasonably be expected to grade students on the curve. 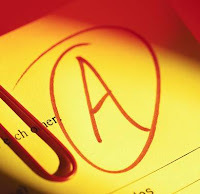 People who use the grades may have an implicit understanding that they are a relative ranking of students, or that they reflect a level of proficiency.